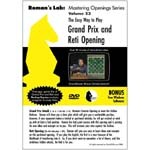 In Volume #23, Roman first explores the Grand Prix Attack (1. e4 c5 2. Nc3 Nc6 3. f4). This is his favorite way to meet the Sicilian. 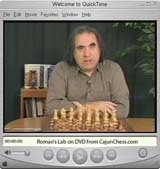 Roman will show you a clear plan which will give you a comfortable position. With the Reti Opening (1. Nf3) Roman will give you easy-to-learn ideas and concepts on this positional opening. If you play the English, the Reti is a must because of the likelihood of transposing. So if you don't want to study a lot of theory, and like ambitious hidden attacks, the Reti is for you.